A new working group will develop guidelines for determining whether moving the primates to sanctuaries is harmful to their health. The research chimpanzees owned or supported by the US National Institutes of Health (NIH) are ready to retire — but nearly 300 are still stuck in 3 US research facilities, awaiting spots at the country’s only federally funded sanctuary. Moving has proved too much for some of the chimps that have already been relocated, most of which were elderly or had chronic diseases. And in the wake of multiple deaths of sanctuary newcomers between 2015 and 2016, the agency is now rethinking how it assesses the primates’ fitness for travel. The NIH will form a working group to develop recommendations for veterinarians to consider when determining whether or not to move a chimpanzee, said James Anderson, director of the NIH’s Division of Program Coordination, Planning, and Strategic Initiatives, at an advisory-council meeting on 26 January in Bethesda, Maryland. “We will move every chimp that is possible while respecting its welfare,” Anderson told the group. The announcement suggests that the NIH might be reassessing its chimp-retirement plans, which have been criticized by scientists who want to continue using the animals in non-invasive research, and by groups who think that the agency is moving too slowly on relocation. Only 78 have been transferred to the sanctuary since 2015. Under US law, the government’s retired chimps can be moved only to a federally funded sanctuary, and just one such facility exists: Chimp Haven in Keithville, Louisiana. According to the NIH’s retirement plans, all of its chimps would be relocated to the sanctuary by 2026 (see ‘Research chimpanzees’). But it’s been slow going since 2015, when NIH Director Francis Collins announced the agency’s intent to retire its remaining research chimps — and it is unclear when there will be enough space for all of them. Chimp Haven has capacity for a total of 230 animals, and as of 1 January, is home to 225 chimps. But the NIH still has 288 chimps in labs. The sanctuary is building a facility slated for completion in 2021, which would be able to house 100 more primates — but that’s still far short of what the NIH needs. The sanctuary will be taking “dozens” more NIH chimps between now and June, says Chimp Haven spokesperson Ashley Gordon. The facility will then assess its next steps. Many have questioned the wisdom of moving the animals. The process involves anaesthetizing the primates for health examinations, shipping them in trucks for trips that can take up to 12 hours, placing them into quarantine at the sanctuary and then introducing them into new social groups. This can be extremely stressful for the chimps. 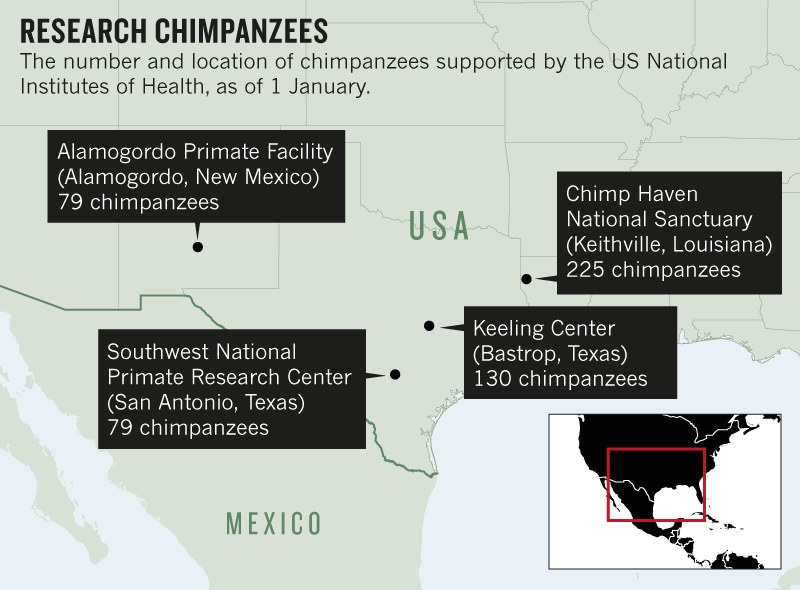 Christian Abee, who directs MD Anderson’s Keeling Center for Comparative Medicine and Research in Bastrop, Texas, sent 13 of his lab’s chimpanzees to Chimp Haven in 2014 and 2015. But within a year and a half of their arrival at the sanctuary, nine had died. A 2016 site visit by NIH investigators concluded that seven of the deceased chimps had been elderly, and that several had pre-existing chronic conditions. Abee thinks that the move contributed to their deaths. Many of the animals at the Keeling Center — and at the other two labs — are elderly or chronically ill, which could make them more susceptible to stressful situations. But between 2015 and 2017, only 8 of the roughly 140 chimps that stayed at MD Anderson have died. 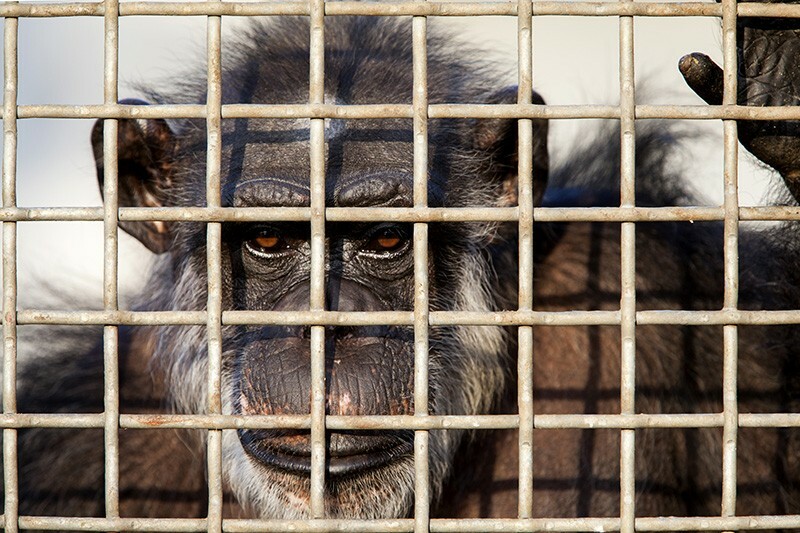 Instead, Abee and others have suggested that the chimps “retire in place” at the labs, in their own social groups. None of the primates are being used in research, and there are no plans to do so. The NIH says that some animals have been deemed too frail to move in the past. But Kathleen Conlee, vice-president for animal-research issues at the Humane Society of the United States in Washington DC, says that the animals deserve to live in a more natural environment. “You don’t want to cause the chimpanzees any harm,” she says, but they should be given the opportunity to live outside of a lab. The NIH says that the formation of the new working group — to be led by Terry Magnuson, vice-chancellor for research at the University of North Carolina at Chapel Hill — wasn't prompted by the deaths at Chimp Haven. The group should have its recommendations ready by May, says Anderson. In the meantime, the speed of transfers is picking up: 42 animals were moved in 2017, compared with only 7 in 2015. Yet even if the animals can be successfully transferred, the capacity problem remains. William Hopkins, a neuroscientist at Georgia State University in Atlanta, questions why the animals could not be placed in a facility that has room for them, rather than waiting on Chimp Haven to build more space. For instance, one large primate enclosure at the Ape Cognition and Conservation Initiative in Des Moines, which Hopkins co-directs, is sitting entirely empty. “We could take 30 chimps tomorrow,” he says. Correction 31 January 2018: This story initially said that the institute co-directed by William Hopkins was the Iowa Primate Learning Sanctuary. It is the Ape Cognition and Conservation Initiative.